ஆசிரியர்கள் நாளை பள்ளிகளுக்கு சென்று குடியரசு தின விழாவில் கலந்து கொண்டு வருகை பதிவேட்டில் தங்களது வருகையினை பதிவு செய்ய வேண்டும் - அருகில் உள்ள உயர்/மேல் நிலைப் பள்ளி தலைமையாசிரியர் கண்காணிக்கவும் CEO உத்தரவு! Respected education minister and secretary sir, before one year public are talked education department going on good. Bcoz of creative ideas, syllabus changing for 11 the STD. But now educational public speaking many confusion in educational department. Don't only view , reduce expenses. Fact is now also education department going on good way. If possible kindly made below changes. 1. 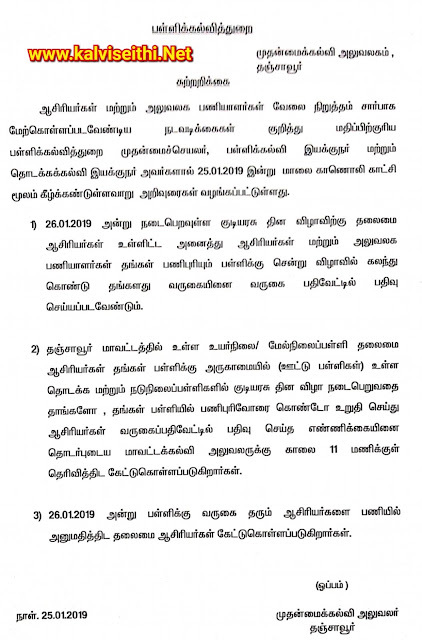 Open all villages LKG and UKG. Only allow sec grade teachers work LKG to 3 ed STD. Give 15 days Montessori training to above teachers. From 4 th onwards appointment Only BT teachers. Don't directly select PG teachers. We are not selected directly thasildar. So u follow the same. Only BT promote PG teachers. In English medium schools from 4 th STD, appointment only who are studied in English medium or English graduates. In this concept, don't consider subject wise ratios 4th to 8th. If anybody not obey u, shuffle the teachers transfer just 200 Kms from working place, reason administration purpose. If u do boldly. As a public view it's 100 percent correct. Don't allow Tamil medium teachers , take classes in English mediums, it's no use. Waste of money. How to maintain quality. It's only suggestions for honourable education minister and higher officials. Thank you. Other department strike maybe accept. But teachers strike not accepted one. U solve Ur problem by court. Bcoz, poor students only suffering. All are educated, Ur children are safely studying in private schools. Who give care for poor once. Am not , talk against Ur strike, bcoz Ur strike maybe genuine reasons. Am talk only about poor children life and quality . Thank you.